Synchronise CCTV Systems using atomic radio-controlled clocks. The time signal transmitted by the National Physics Laboratory is the most precise time available, accurate to 1 second in 1,000,000years. The Galleon range of Atomic Radio Clocks uses the signal to synchronise the time recorded on video surveillance equipment. GalleonARC-Clocks can synchronise the time on video sequencers, Digital Multiplexers, CCTV system or directly onto the video signal beforerecording. The signal can be received up to 1500 kilometres from either Rugby in the UK or Frankfurt in Germany. Video Sequencer/Multiplexer serial port and have driver software to set the time on most video sequencers and multiplexers. Ensures that the correct time is always recorded on tape. Automatically adjusts between Summer/Winter Time. No need to remember to change your clocks manually. Log exactly when events occur. Set the correct audit-able time on CCTV recorder. Over 20,000 GALLEON Atomic Radio Clocks installed and working. Stamp the correct synchronised time onto a single VCR or monitor. Video TimeStamper master. 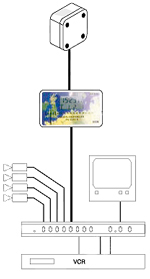 The TimeStamper for CCTV provides an on-screen time and date display for CCTV systems and is connected in-linejust before the monitor or VCR. Works with coax systems. Includes Atomic radio time receiver, VCR coax interface (input and output), and adisplay for time, signal strength and date. Remote Antenna for TimeStamper Master. The remote antenna adds the ability to mount a receiving antenna up to 500 feet 150meters away from a TimeStamp master to improve the signal reception in areas were there is a weak radio signal. The remote antenna m can bemounted in a roof space or on a external wall. Unit is sealed to IP65. Video TimeStamper slave. The TimeStamper slave receives the time from a TimeStamper master thus saving the cost of a second Atomicradio Clock receiver. TimeStamper slave provides an on-screen time and date display for CCTV systems and is connected in-line just beforethe monitor or VCR and works with coax systems. Tecton (Drax)TimeController Synchronises the time on Tecton, Montage or Vicon multiplexers. The TimeController provides a serial outputto synchronise the CCTV multiplexer once every hour, Includes Atomic radio time receiver mains powered, serial interface, time, signalstrength and date display. MontageTimeController Synchronises the time on Tecton, Montage or Vicon multiplexers. The TimeController provides a serial outputto synchronise the CCTV multiplexer once every hour, Includes Atomic radio time receiver mains powered, serial interface, time, signalstrength and date display. ViconTimeController Synchronises the time on Tecton, Montage or Vicon multiplexers. The TimeController provides a serial output tosynchronise the CCTV multiplexer once every hour, Includes Atomic radio time receiver mains powered, serial interface, time, signal strengthand date display. BaxallTimeController Synchronises the time on Baxall multiplexers. The TimeController provides a serial output to synchronise theCCTV multiplexer once every hour, Includes Atomic radio time receiver mains powered, serial interface, time, signal strength and datedisplay. Remote Antenna for Time Controller. The remote antenna adds the ability to mount a receiving antenna up to 500 feet 150 metersaway from a TimeStamp master to improve the signal reception in areas were there is a weak radio signal. The remote antenna m can be mountedin a roof space or on a external wall. Unit is sealed to IP65. All prices are ex-works and exclude VAT - Delivery Charge of £10.00 per item.